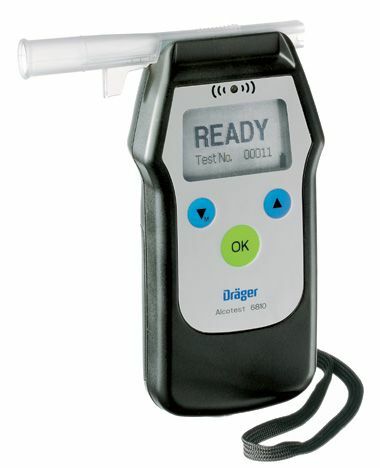 The Drager Alcotest 6810 offers professional users rapid and precise breath alcohol analysis. The handheld instrument maintains the popular compact, user-friendly form and offers printing capability to the Drager Mobile Printer. Thanks to it's configurability, large memory capacity, and real-time clock, it can be easily adapted to meet law enforcement guidelines and regulations. SAFE AND EASY TO USE - The large backlit display, rapid startup time, and intuitive, hygienic operation make the instrument easy to use. Since measurement functions are controlled via a single key, results are obtained safely and quickly without distractions. QUICK AND PRECISE ANALYSIS - The 1/4" DragerSensor technology is alcohol-specific and provides precise measurement results even under extreme conditions (as low as 23°F/-5°C). Fast pneumatic components and short sensor reaction times ensure the measurement result will be displayed quickly. Measurement quality exceeds NHTSA'S Model Specifications for Evidential Breath Testers. PRACTICAL DESIGN - Thanks to compact dimensions and ergonomic design, the instrument is equally easy to use for right and left handed people. The separation of the grip area and the mouthpiece ensures a safe distance between the hand of the operator and the mouth of the person to be tested. "SLIDE 'N CLICK" MOUTHPIECE - The individually wrapped mouthpiece is designed to be fitted quickly, hygienically, and securely even in poor light conditions. Similarly, the integrated ejector tab makes mouthpiece removal effortless and sanitary. An unobstructable air outlet prevents any manipulation when the breath sample is given. The mouthpiece features a built-in spit trap and an orientation that protect the operator from a subject's direct exhalation. users to adjust parameters such as service lockouts, sampling modes, and test reason type/codes. Results can be displayed in over 10 different units of measure, or in a Pass/Alert/Fail format. The PC interface supports extra service functions and customization options. BATTERY LIFE - More than 1500 tests can be conducted with two AA batteries. AUDIO VISUAL INTERACTION - Interaction between operator and instrument occur via the backlit LCD display with plain text messages (selectable language), multi-color LEDs, and audible signals. POWERFUL DATA MANAGEMENT - A precise real-time clock: all data is associated with an accurate date and time stamp. Menu keys allow quick access to over 200 measurement results with respective test numbers and date/time, which can be reprinted on demand. Test results are easily downloaded via a PC interface.